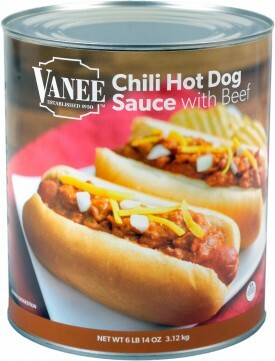 Vanee Chili Hot Dog Sauce with Meat is Joe Vanee's original recipe of ground beef, ground beans and quality chili spices. Great on chili dogs, fries, baked potatoes, and nachos. Vanee Chili Hot Dog Sauce with Meat frees up valuable freezer space by being shelf-stable, has lower sodium than the national brands, is formulated to work with your chili pump, and is heat and serve for ultimate back-of-house simplicity. Each 110 oz. can has 51 quarter-cup servings, for 306 total servings in a case. Great for chili dogs, nachos, fries, or baked potatoes. Water, Beans, Beef, Tomato Paste, Food Starch - Modified, Spice, Salt, Onion Powder, Paprika, Enriched Wheat Flour (Wheat Flour, Niacin, Ferrous Sulfate, Thiamine Mononitrate, Riboflavin, Folic Acid), Corn Flour, Sugar, Flavor (Torula Yeast, Maltodextrin, Flavoring), Garlic Powder, Natural Coloring and Flavoring.